In EA-7 (as defined in Chap. 1, i.e. EA excluding South Africa) demand for power is expected to undergo a three-fold increase by 2030, as a result of both electrification (new consumers who gain access), and of increased consumption by already electrified households and by an emerging industrial sector. 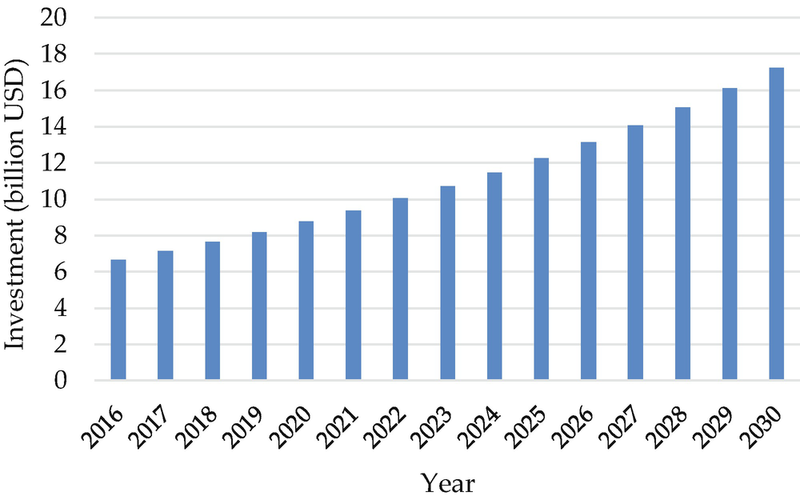 According to projections, the compound annual growth rate of electricity consumption is projected at 7.1%, with a total increase from 40 TWh in 2015 to 112.5 TWh in 2030 (Table 4.1). Residential demand will also grow robustly (on average + 10.7% per year). The largest growth rates are expected in countries that currently consume very little power, including Burundi and Rwanda, but in absolute terms the largest increase will be observed in Kenya and Tanzania, the two major economies in the region, where the emerging regional industrial sector will push up the demand. Mozambique, currently the first consumer in the region due to its power-hungry mining sector (representing 70% of the total demand), displays a lower-than-average expected electricity consumption growth rate (+6.6%). This is owing to the already relatively high per-capita consumption of electrified consumers (264 kWh/capita/year) with respect to the rest of EA-7 (which averages at 187 kWh/capita/year). Further reasons include the weak grid transmission system in place and the large extent of the country, which together are prone to determine a high penetration of decentralised electrification solution and thus a lower per-capita consumption. which is the least-cost way of delivering access to the EA-7 population without access. The bulk of the installed capacity of EA-7 is given by hydropower, with medium and large-sized dams (overall 3 GW) providing almost the entire power supply of the countries under analysis. Note that at least a further 15 GW of capacity have been planned. Other renewables (solar, wind, geothermal, and biomass) display a penetration of 10%, with 600 MW of geothermal capacity in Kenya, and some wind (e.g. the 310 MW Lake Turkana farm in Kenya) and solar (e.g. the 10 MW Tororo station in Uganda) recently, or being in the process of, coming on-line. Gas-fired generation is significant only in Tanzania (more than 700 MW operating). Diesel and HFO account for further 500 MW in EA, and they play an important role in Kenya, where they account for roughly 25% of national generation. Installed coal generation capacity is currently very limited (0.25 GW of installed capacity). Significant plans exist for developing coal power plants in different countries, including Kenya and Mozambique. To discuss the potential evolution of the regional grid-based electricity generation mix up to 2030 (the planning horizon adopted in this analysis, as well as that of SDG 7), three scenarios have been designed. Scenario 1 represents a trajectory of slightly reduced dependency from the predominance of hydro (with capacity additions of up to +12.5 GW), implementation of on-grid REs (+1.6 GW) and some coal (+1.1 GW), and the bulk of new non-hydro capacity based on NG (+4.6 GW). It is a scenario where EA-7 NG resources are developed for domestic use and a NG pipeline distribution network begins to be developed across the region. Overall, the shares of hydro, coal, and REs diminish, as in relative terms capacity additions are lower than those of NG and of the increase in electricity demand. Scenario 2 describes a path where NG is partially devoted to exports out of the region. Its overall share remains constant (with +1.4 GW added), while the bulk of non-hydro capacity additions is coal-based (+4.5 GW), with both coal imports (from South Africa, DR Congo and Zimbabwe), and coal-mining activity (in Tanzania and Mozambique). As in Scenario 1, the share of REs for on-grid decreases slightly over the period (+1.6 GW). Hydropower continues to represent the majority (+50%) of total capacity (+11 GW added). Scenario 3 is a pathway of rapid REs (+4.8 GW) uptake in tandem with NG production for domestic generation (+3.8 GW), where coal share remains constant (5%, i.e. +0.25 GW) with respect to the current share, and hydropower share is slightly less prominent (+11 GW), with a final configuration of roughly 50% for hydro and 22.5% each for NG and REs. The projected levelized costs of electricity (LCOE)1 generation for each technology up to the year 2030 are reported in Table 4.3. Figures take into consideration expected cost profile changes of the different generation technologies. For NG (the only generation technology considered for which the fuel costs makes a highly significant difference in rendering it competitive or less) we estimated—based on Demierre et al. (2015) and expert assessment—that the domestic gas price of gas in EA until 2030 will be around 4–5 USD/Mbtu, and therefore that the average LCOE of gas-fired generation will stand at 0.06 USD/kWh. Starting from these LCOE figures, the average cost of grid electricity generation2 for each scenario has then been calculated, and they are reported in Table 4.4. For Scenarios 1 and 3, which determine a higher penetration of NG-fired generation, no additional costs accrue for Tanzania and Mozambique (which are endowed with reserves), while a cost premium for other countries which would have to import such resources is added. In Scenario 3, where RE are also prominent, these are rendered relatively costlier in smaller countries because it is assumed that their size will prevent them to achieve the scale dynamics associated with the greater potential of larger countries. Finally, in Scenario 2, where coal-fired generation gains a significant share, smaller countries more distant from coal-bearing areas (Mozambique, Zimbabwe and DR Congo) face a higher price. The next Sect. 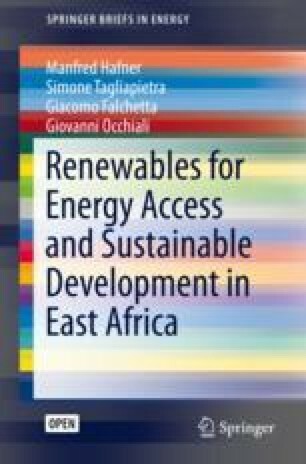 (4.2) will be devoted to an analysis of the least-cost ways to bring access to electricity to the populations that currently have no access to electricity in EA-7. Subsequently, Sect.4.3 will estimate (1) the investment required and (2) costs for satisfying the growth in the demand for power from the population that has currently access as well as from the industrial sector. An electrification model (the OnSSET, Open-Source Spatial Electrification Tool, developed by the Department of Energy Systems Analysis at the KTH Royal Institute of Technology; see Mentis et al. 2017) is used to compute the required capacity and investments needed to attain a least-cost 100% electrification by 2030 in all EA-7 countries (as in compliance with the UN’s Sustainable Development Goal 7). South Africa is excluded from this analysis due to the already high level of access to electricity in the country. The grid-based power generation mix scenario (as defined in Table 4.2 above). The electricity demand tiers in urban and rural areas, respectively. A high-tier scenario (with 423 and 160 kWh/person/year in urban and rural areas) and a low-tier scenario (with 160 and 44 kWh/person/year in urban and rural areas) are defined. 423 kWh/person/year (higher-tier in urban areas) further include medium or continuous appliances, such as water heating, ironing, water pumping, refrigeration, and microwave. The high-tier scenario could thus be thought as an evolution from the low-tier scenario, i.e. as a scenario which includes not only the provision of basic household electricity, but also the additional demand for power from the rise of handicraft, the opening of small businesses, and the gradual growth over time in power consumption from newly electrified households. Note that in the analysis a discount rate of 10% has been considered. The discount rate is an important parameter in determining the results of scenario analysis, since it is the factor which measures the rate at which a society is willing to trade present for future consumption (i.e. costs and benefits in the present and in the future). The decision to set it precisely at 10% was made from Pueyo et al. (2016)’s treatise on the discount rate in RE projects in Sub-Saharan Africa. The authors refer to the fact that the World Bank typically adopts a social discount rate of 10 per cent to assess infrastructure investments in developing countries, and that—for instance—cost-benefit analyses in Kenya use a social discount rate of 10%. Figure 4.1 reports the average country-level required investment (including investment for both capacity additions and the installation of the necessary transmission and distribution grids) for providing least-cost access to the entire population of EA-7 by 2030. On the left-hand-side, the numbers refer to the low-tier consumption objective, while on the right-hand-side they imply substantially higher per-capita demand of newly electrified households. Overall, the average total required investment for EA-7 stands at $86 billion, or $5.8 billion/year until 2030. Switching from low to high consumption tiers implies—on average—an 85% increase in required investments (from $61 to $113 billion). Results show that Tanzania, Kenya and Uganda are the countries with the largest overall investment required to electrify households without access by 2030. Between today and 2030, the three countries will have to electrify 72 (Tanzania), 53 (Kenya), and 55 (Uganda) million people if they want to attain full electrification (accounting for population growth). With regards to the optimal technology mix, Figs. 4.2 and 4.3 report for each generation technology the range of required capacity additions and investments in each country across the scenarios considered. In the graphs, grid refers to electrification by grid-connection, MG defines mini-grid systems, and SA refers to decentralised stand-alone solutions. As shown in Fig. 4.2a, Tanzania and Uganda together require around half (3.5 GW) of the total (7 GW) new grid-connected capacity additions for delivering 100% electrification to those without access in EA-7. Kenya and Mozambique require a median of 1 further GW each. Interestingly, the range of uncertainty across scenarios is relatively little for Kenya and Mozambique (0.6–1.4 GW in both countries), while it becomes larger for Tanzania (1–2.8 GW) and Uganda (0.7–2.4 GW). This implies that in Kenya expanding access through grid electricity remains a relatively efficient solution as opposed to decentralised solutions under all costs and demand scenarios analysed. The result stems from the fact that among EA-7 countries, Kenya has already the highest electricity access rate (56%, with 77% in urban and 39% in rural areas). Thus, relatively little grid-based generation capacity is required to feed the remaining non-electrified centres. Mozambique, which is the second largest country in terms of total surface area after Tanzania, requires less than half of the median grid-based generation capacity required by Tanzania. This is due to its population being only half of that of Tanzania, to the very low population density of 37 people/km2 in Mozambique as opposed to a density of 63 people/km2 in Tanzania, and to the weak electricity transmission network in place. In Mozambique, limited interconnections exist between the south, in proximity of the capital city Maputo, the centre, around the Zambesi river basin, and the north, where currently the bulk of the transmission grid is installed. The massive Cahora Bassa dam, located in central Mozambique, is only connected to transmission lines to South Africa and towards the north of the country. Such conditions render grid expansion only economically feasible in high density provinces, and in turn make standalone (SA) and mini-grid (MG) all very significant generation solutions to fully electrify the country at the lowest cost. 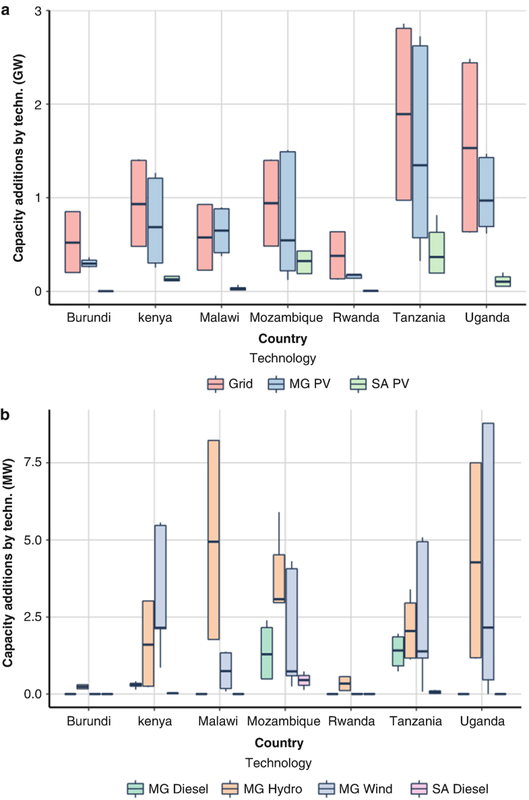 In small-sized but densely populated EA-7 countries, namely Burundi and Rwanda, grid electricity takes up the bulk of access expansion, with 0.5 GW of median on-grid capacity additions in each country (Fig. 4.2a). 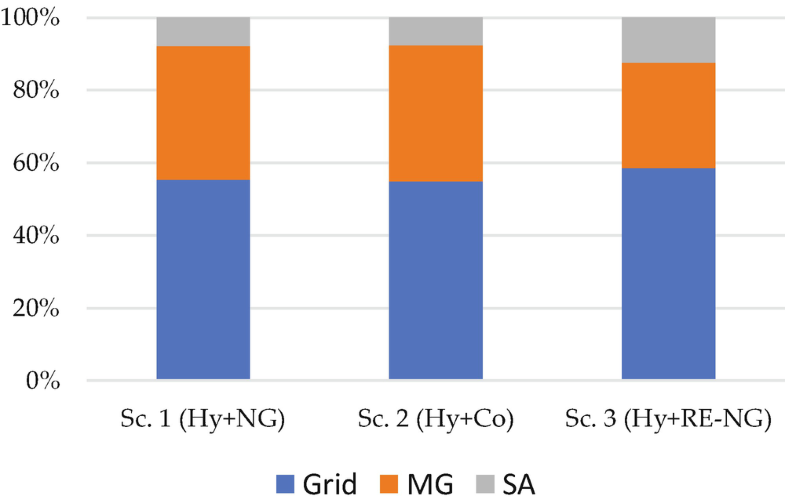 Also in Malawi around 0.5 GW of on-grid capacity is required, but in addition mini-grid solutions also have a prominent role in realising least-cost electrification (with median required capacities of 0.6 GW for PV and 5 MW for hydro, see Fig. 4.2a, b). Comparing model results for capacity additions (Fig. 4.2) and investment required (Fig. 4.3), it is interesting to observe how the required investment for grid electricity in Kenya ($12 billion) is similar to that of Tanzania ($14 billion) and Uganda ($11 billion), irrespective of the notably lower capacity addition required (see Fig. 4.2a). This is due to the fact that grid expansion will constitute a major source of costs for achieving 100% access in Kenya, as the figures of required investment include investment in new transmission grid capacity. Furthermore, important MG solar investments are required in Tanzania ($7 billion) and Uganda ($5 billion), while SA PV investment is prominent in Tanzania ($4 billion) and Mozambique ($3 billion). Concerning minor technologies (in terms of their penetration), MG hydro will have the greatest required investments in Malawi and Uganda (around $40 million in each), countries with substantial potential and conditions for small-scale hydro development, while it will also require $25 million in Mozambique and $19 million in Tanzania. MG wind requires around $ten million in each of Kenya, Tanzania, and Uganda. The only country where SA diesel will have a notable required investment, namely $5 million, is Mozambique, where—in particular in non-electrified but densely-populated coastal areas—it would be the least-cost option due to the low fuel transportation costs. The regional least-cost electrification situation is outlined in the maps of Fig. 4.4. These provide a visual insight into the technology with the lowest levelized cost of electricity in each square-km area of EA-7 given the electrification tier set under the scenario parameters in examination. Two cases are reported, namely the high and low-consumption tier variants of Scenario 3 (high penetration of renewables and NG). 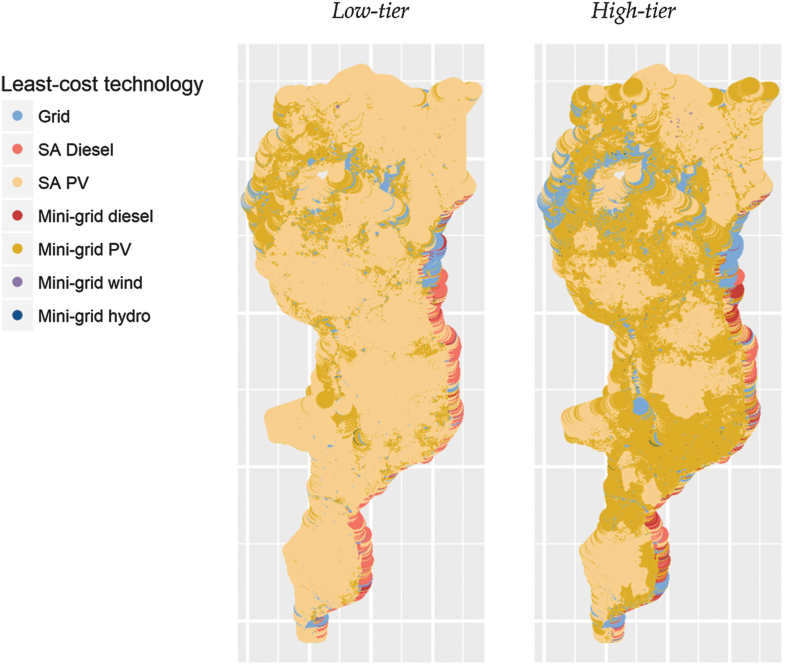 It can be observed that independently from the case considered, in the vast majority of the region solar mini-grid and off-grid are the least-cost options, while in coastal areas diesel is a viable option due to the very low transportation costs it faces there. Grid electricity is least-cost in large urban areas, mostly in the northern part of EA. Wind and hydro mini-grids are instead only cost-competitive in very circumscribed areas of high potential and population density. 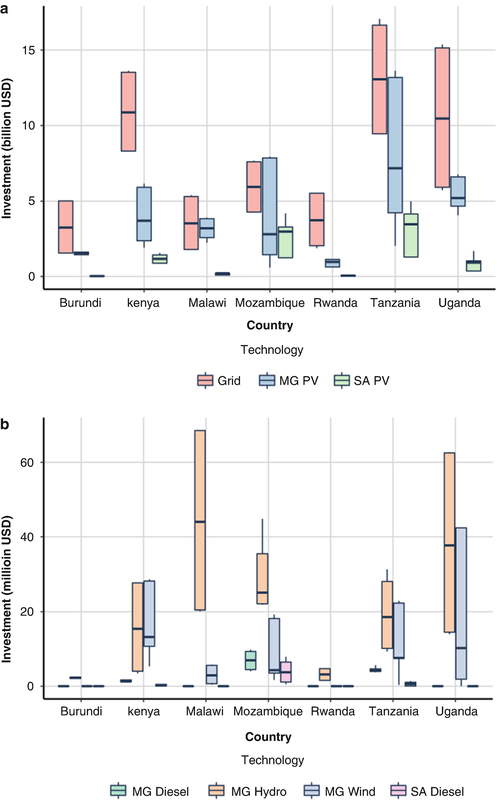 A higher electrification tier increases the number of locations where on-grid electrification is least-cost and it boosts the relevance of solar MG vis-à-vis that of solar SA. Maps for all the remaining scenarios are found in Appendix B. As can be seen in Fig. 4.5, to achieve full-electrification, grid generation capacity additions and its extension are always the largest investment component, with a mean value of 58% of total required investments, while MG mean investments stand at 34% and SA mean investments at 9%. Total corresponding capacity additions across the three scenarios stand at 13 GW, roughly split into 50% of grid capacity, 41% of mini-grids (including PV, wind and hydro-based solutions) and 8.5% of standalone solutions. Results hence show that mini-grid solutions will have great importance in fostering electrification, irrespective of variations in the price of grid electricity. This is owing to two key facts, namely (1) that in most EA-7 countries the national grid is still weakly developed and the cost to be borne to extend it are massive and not efficient, at least if the objective is that of achieving the tiers of electrification which were considered in our modelling exercise; (2) that those without access are often remote for the national grid but concentrated in medium/high density settlements where a joint generation system is more cost-effective than each individual household installing a private device, even at low levels of per-capita power consumption. It must be remarked that such estimates are conservative, in the sense that they are served to reach at most a tier of consumption of 423–160 kWh/person/year in urban and rural areas, respectively. Such values remain low if compared with the current average residential per-capita consumption levels of South Africa, standing at 807 kWh/capita. The model output figures are in fact addressing the challenge of bringing a minimum guaranteed level of access to electricity to the entire population. More realistic estimates, tailored to the specific needs of each region within each country, should be addressed by country-level or sub-national studies. The average investment required by 2030 to provide universal access to electricity in EA-7 stands between $113 and $61 billion for high and low-tier consumption levels, respectively. This averages at $87 billion USD, which corresponds to roughly 5.8 billion/year in the model’s planning horizon between 2015 and 2030. If we take as a benchmark the mean full electrification cost of USD 21 billion per year estimated in the PBL Netherlands Environmental Assessment Agency’s Towards universal electricity access in Sub-Saharan Africa report (2017) and we divide it by the share of the EA-7 population over the total SSA inhabitants (i.e. 21%), we find a value of 4.4 billion USD/year. This suggests that the two figures are relatively similar, and that analogous results are achieved using different models, parameters, and methodology. 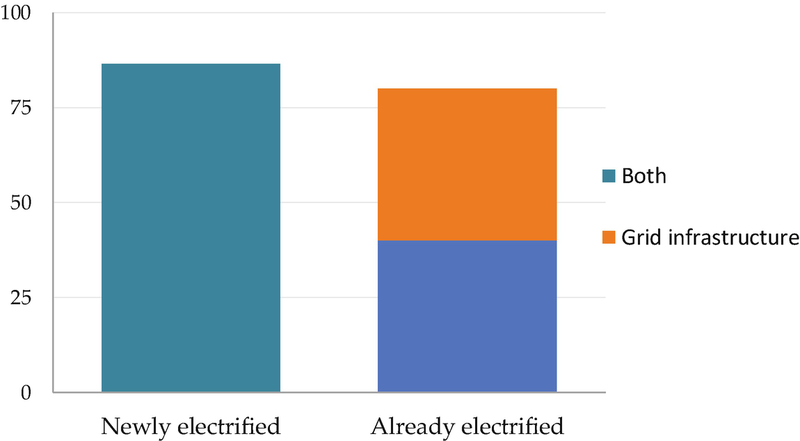 Finally, along with a comment of the results, it is meaningful to describe the main limitations of the least-cost electrification exercise, so that readers can interpret the results in a meaningful way. The different scenario results are informative in terms of the comparative information they provide, rather than the absolute output values they suggest. Comparing scenarios with different parameters can shed light on the relative significance of different factors in determining the optimal power mix to achieve least-cost electrification. The model itself embeds a long-list of assumptions and of a priori set parameters which might not necessarily reflect the actual state of things in the different EA-7 countries under examination, even if we have accounted for some of the specific characteristics of each country in setting the relative variables in each scenario run. The same holds for projections over the evolution of demographic and cost variables up to 2030. Another caveat stems from the fact that the model does not account for non-electric needs (e.g. clean cooking), but it simply estimates the least-cost way of providing universal access to electricity within a country. For governmental planning purposes, a more in-depth and detailed study, based on field-data assessment, would need to be carried out. In EA-7, additional demand growth will represent a further significant challenge beyond the provision of universal basic access to electricity. Demand for power is projected to grow at an average yearly rate of 7.1% as a result of both a greater per-capita consumption from those who already benefit from access today and of increased industrialisation and mechanisation of agriculture. Therefore, we calculate the up-front investment required to match the growth of the demand for power generation of those already electrified (including from non-residential sectors) over the three grid electricity generation mixes scenarios introduced in Table 4.2. Investment costs for each technology in Africa are drawn from Enerdata’s Study of the Cost of Electricity Projects in Africa report (2016). The mean required investments range is within a rather narrow range (Fig. 4.6), i.e. between $41.2 billion for a scenario of reduced diversification from hydropower (Scenario 1) and $38.7 billion for a RE-NG expansion scenario (Scenario 3), with the coal-based expansion scenario (Scenario 2) requiring $39.1 billion. It is then clear that in investment terms there is very little difference across the three scenarios considered. Overall, in all scenarios the bulk of the required investment to cover the additional demand in EA-7 (i.e. not stemming from new connections) is for hydropower capacity. At the same time, the projections show that the investment required for capacity addition in order to cover the demand growth from connected customers are on average around 50% of those needed for expanding electricity access (which however also include investment to expand the national grid where that is necessary to deliver electricity). Table 4.5 reports instead the total power generation cost which will need to be covered to satisfy the baseline consumption growth (i.e. not stemming from newly electrified consumers) until 2030 under each scenario. Generation costs, differently from investment, are not the component required up-front, but rather the overall cost required over time, taking into consideration the investment component, the fuel component and the operation and maintenance components (i.e. the LCOE multiplied by the amount of electricity generated between 2015 and 2030). Results show that for all countries Scenario 3—that of a capacity expansion based on RE and NG—is the cheapest solution to satisfy grid-based electricity demand. Scenarios 1 and 2, i.e. those of power expansion backed by NG or coal, respectively, show instead higher costs, with Scenario 2 being the costliest (+10% vs. Scenario 3). According to our results, Scenario 3 (RE-NG-based expansion) will be both the one with the lowest upfront investment (although this will be very close to the upfront investment of a coal-based expansion scenario), and the cheapest over the long-run. While hydropower will continue to have the most prominent role, the future power mix will depend on political choices taken over the next decades. Overall, according to the scenarios elaborated in this analysis Scenario 3 (RE-NG-based expansion) will be both the one with the lowest upfront investment (although this will be very close to the upfront investment of a coal-based expansion scenario), and the cheapest over the long-run. RE-NG development (Scenario 3) will guarantee lower future costs (−10% than Scenario 2 and −4.5% than Scenario 1), while it would also contribute to attain a lower (greenhouse gas emissions pathway (−45% vs. the coal-based expansion of Scenario 2 and −25% vs. the gas-based expansion of Scenario 1 in year 2030, as seen in Fig. 4.7) and local pollution levels. Carbon dioxide emissions are the first driver of human-induced global warming and climate change, for which multiple studies (see IPCC 2014) have predicted an adverse socio-economic impact on developing economies of Sub-Saharan Africa, where the financial capacity for adaptation is limited. The projected emissions of EA-7 by 2030 under all scenarios are negligible if compared to the current global emissions (they would represent a share of around 0.11% of total current emissions). Nonetheless, a more sustainable development path—like that of Scenario 3—still allows to reduce the social costs of power generation (even locally, for instance with the emission of less local pollutants such as those resulting from coal combustion). Note that however such external costs have not been included in this analysis. The results of our analysis in the previous sections show that the investment so that generation capacity addition matches demand growth beyond electrification (standing at a mean of $40 billion) are around half of those needed for new electrification itself (namely $87 billion for a mean level between low and high-tier consumption). However, the figure of investments for newly electrified consumers already includes grid extension investment where this is necessary to deliver electricity, while that for already electrified consumers only includes power plants additions. 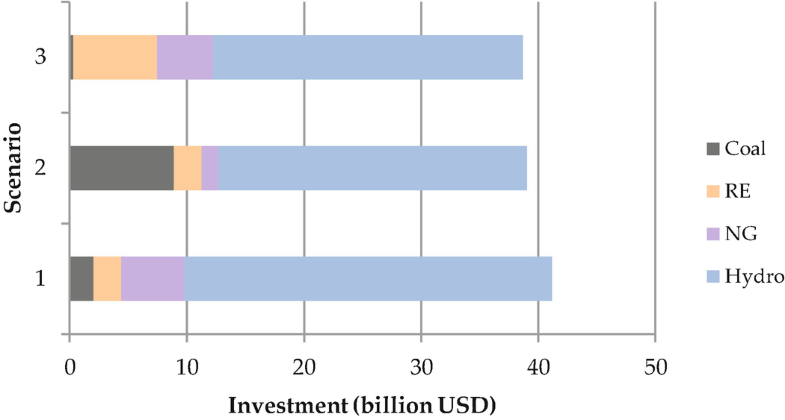 Assuming that—in first approximation—transmission and distribution investments needed to accompany the power generation expansion are generally similar to those of the generation investment itself (IEA 2016), we derive for the grid based investments a total investment cost for power generation, transmission, and distribution of about $40 billion dollars between 2016 and 2030. Summing them to investments for new electrification, a total requirement of $167 billion in a time span of 15 years (2016–2030) will be needed for EA-7. Figure 4.8 highlights this key finding. Thus, it results that the two typologies of investment are similar in magnitude. Yet, the two cannot be directly compared, since they present some substantial differences in terms of the underlying financing dynamics. While investments for already electrified and non-residential consumers will mostly be sustained directly by the consumers of such additional power (via bills), the electrification investment for new consumers will be instead affected by issues on inability-to-pay for the upfront investment required, in particular for grid-connection charges. As a result, the two investment requirements will need to resort to different sources and modes of financing, which are discussed later in this book (see Sects. 5.4 and 5.5). To put results in perspective, the required investment per-capita and as a share of GDP (both current and PPP) have been calculated for each country and in each year. 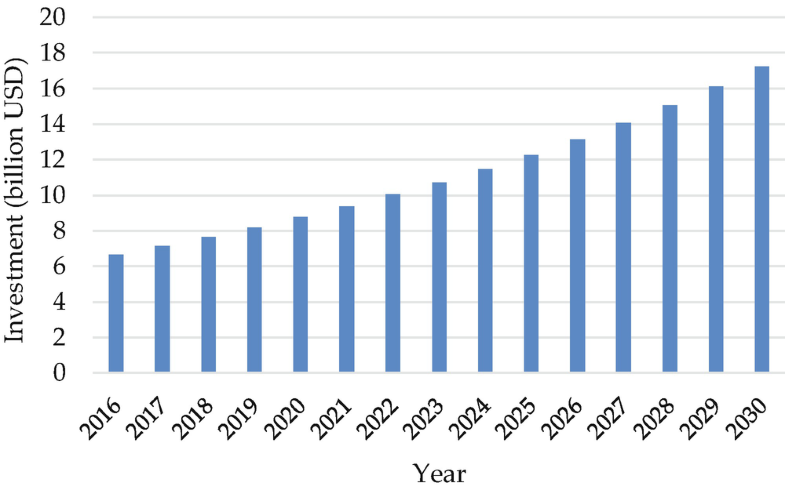 In doing so, it was assumed that investment will not be evenly distributed across the 15 years under consideration, but rather that it would increase in an exponential fashion, namely at the same rate at which electricity consumption is projected to grow between 2016 and 2030 in each country. Figure 4.9 plots a representation of such evolution of total required investment over time for both newly electrified and already electrified consumers in EA-7. Country-level investment figures for newly electrified consumers are reported in Table 4.6. They refer to the mean value between low and high-tier levels of consumption. The table also shows the required investment as a share of GDP (in both the exchange-rate, PPP, and weighted formulations) in 2016, and average per-capita per year within each country. Results suggest that the average per-capita investment (accounting for the entire population, even those who already have electricity access) for electrifying households currently without access stands in the range of $19–25 per capita, with the regional EA-7 figure at $22. When calculating the same figure but only for the population currently without access (thus what hypothetically each person should finance himself to gain access), the figure rises to a range of $33–42 per capita, with however only marginally higher values in many countries (as a result of low-electrification rates, which make the total population and the population without access similar). This represents roughly 1.9% of the national GDP in exchange rate terms in the initial year (i.e. 2016), or 0.7% in PPP terms. Whether to consider the exchange rate or the PPP GDP as the reference metric depends on the destination of the electrification investment, i.e. whether the installed infrastructure and the corresponding labour will be of domestic or foreign origin. According to experts’ assessment, in EA-7 roughly 25% of the investment is expected to target the local industry, labour and public sector, while the remaining 75% will finance international acquisitions of technology and materials and international corporations operating in EA-7 countries. In particular, hydropower, thermal, PV, and transmission and distribution grid will be largely constituted by foreign assets, especially hard infrastructure built abroad. Thus, it might be reasonable to consider a weighted formulation of GDP, which is given by the weighted average of PPP GDP for international-targeted investment and of exchange rate GDP for local-targeted investment. Such metric is reported in the last column of Table 4.6 (for newly electrified consumers) and of Table 4.7 (for already electrified consumers). Again, it must be remarked that for newly electrified consumers we are considering a mean value between high and low tiers of consumption as defined in Sect. 4.1. If we look at the actual results for each of the two tiers, the investment requirements stand at 1.3% (low-tier) and 2.4% (high-tier) for the exchange rate GDP, at 0.5–1% of the PPP GDP, and at 0.9–1.6% of the weighted GDP. Thus, increasing new electrification efforts from the low to the high tier would result in around a doubling of investment requirements for bringing access to households currently without power. As discussed in Sect. 4.1, the high-tier scenario can be thought as an evolution from the low-tier scenario, i.e. as a scenario which includes not only the provision of basic household electricity, but also the additional demand for power from the rise of handicraft, the opening of small businesses, and the gradual growth over time in power consumption from newly electrified households. All these activities would contribute to rural development, and thus to increasing the national GDP. Further macroeconomic analysis—in the form of benefit-cost analysis (BCA)—would be required to assess the economic significance of performing the larger investment to provide high-tier consumption access. Table 4.7 shows—in the first row—results on a regional level for the investment required to satisfy the additional demand growth of already electrified consumers, and—in the second row—investment for total electrification (given by the sum of required investment from newly electrified and already electrified consumers). While results for already electrified consumers are very similar to those for new electrification, total investments results for EA-7 as a whole stand at an average of $42.5/capita per year, which correspond to 3.6% of EA-7’s exchange rate GDP, 1.4% of PPP GDP, and 2.6% of the weighted GDP in year 2016. To put such figures into perspective with the regional socio-economic and financial context, a number of national statistics for EA-7 countries is reported in Table 4.8, including the savings rate, the poverty rate, per-capita income, and information on the Official Development Assistance (ODA) and on the net inflows of Foreign Direct Investment (FDI), as well as on the current yearly investments in the power sector with private participation (where available). For such indicators, which by their own very nature tend to be volatile (e.g. sometimes due to a single mega-project), we considered the average between 2010 and 2017. Such figures enable a better understanding of the current situation vs. the projected trends in EA-7 countries, and thus of the challenges and opportunities to satisfy the investment requirements for electrification. We observe that in general EA-7 countries display relatively high savings rate as a share of GDP (with a high of 28% in Mozambique, and significant shares in Tanzania and Uganda). Only Burundi displays negative savings. While in an ideal economy savings is equalised to investment, in the context of EA-7 a large part of savings is detained by individuals and companies as a result of the unsuitable and insecure investment environment, therefore slowing economic growth and development prospects. For example, a savings rate of 28% of GDP in Mozambique denotes that in 2016 around $3.5 billion have been saved, a figure 6×-times larger than the required electrification investment for households without access in that year. At the same time, the very high share of the population living below the poverty line in Mozambique (46%) suggests that the bulk of such savings is owned by a small share of the population in the country, a finding which is underlined by Mozambique’s Gini index of income inequality,4 standing at 0.46 (well-above the world’s average). Thus, observing the GNI per-capita figure is representative in so-far it gives a sense of the different income level across EA-7 country, and yet it reveals little about the ability-to-pay of households to afford connection to the national grid or the purchase of standalone solutions. Other interesting insights come from the observation of Official Development Assistance (ODA), both in per-capita and as a share of GDP terms. ODA is particularly relevant in small economies such as Burundi and Malawi, while more developed economies such as Tanzania and Kenya only received 7% and 4% of their GDP, respectively, or around $55/capita. A different situation is instead outlined when looking at the flows of Foreign Direct Investment (FDI): here, the largest inflows have been towards Mozambique (FDI is as large as 29% of the national GDP), in all likelihood driven by the energy resource-abundance found in the country (with both considerable coal and NG reserves under exploitation). Nowhere else in EA-7 such high rates are found. The second-highest FDI as a share of GDP is in Malawi, followed by Tanzania and Uganda, with the other countries exhibiting figures between 1% and 3%. However, the per-capita terms FDI figures are more significant, as they are not biased by small-sized economies. While Mozambique remains by far the first destination of foreign investment ($147/per capita), Tanzania ($32/per capita) emerges as the second destinations over the last decade. Interestingly, the average figure (excluding Mozambique, since it represents an outlier) stands at $20, and it is not far from the per-capita required total electrification investment. Nonetheless, the FDI figures alone do not tell much about the destination and the end-use of such investments. In some instances, such as for NG in Mozambique until today, investments may be almost totally serving export purposes, and living little wealth or room for development prospects in the country. For five countries, the World Bank reports the absolute figure in USD for the investments in power energy with private sector participation,5 from which we also derive the number as a share of FDI. This is an interesting metric to understand the liveliness of the investment sector and its significance on the overall flows of foreign investments. However, it must be born in mind that—as referred by Eberhard et al. (2017)—over the last 25 years half of the total investment in power generation plants in Sub-Saharan Africa has stemmed from governments and utilities, while the reminder has been split between 22% of IPPs, 16% from China, and 11% from ODA and FDI. This—combined with subsidies on electricity rates—has resulted in large governmental and utilities deficit, which call for larger private sector participation in the investment effort. In particular, in Mozambique the average investments in the power sector with private participation between 2010 and 2017 amounted to only $0.22 billion, i.e. 5.6% of the average inflows of FDI, and still 65% below the required investment in 2016 to reach universal access by 2030. In Kenya, private-participated investments in power averaged at $0.46 billion (or 55.5% of FDI), 28% less than the required investment for attaining full-electrification. In Rwanda average investment stood at $0.11 billion, but in this case, they represented around 23% more than the required investment for newly electrified consumers, setting the country on a successful pathway to attain full-electrification even earlier than 2030 and without heavy burden on the public finances. In Tanzania, private-participated investments in power stood at 8% of FDI, i.e. 75% below the level for attaining electrification, rendering the country one of the most public finances-dependent in EA-7. In 2018 the country secured a $0.45 billion loan for power projects from the World Bank. Finally, in Uganda the mean investment stood at $0.04 billion, less than a 5% of the required budget for attaining 100% electricity access by 2030 in the country, thus requiring considerable efforts to scale-up private investment. Overall, the results of this analysis show that achieving electrification targets set for the year 2030 present substantial costs (a total of about $167 billion for newly electrified, already electrified consumers, and other sectors). If this figure is put in perspective and observed in per-capita or as a share of GDP terms (overall $42.5 per capita or 2.6% of weighted GDP), it seems that investment requirements are more affordable than one could think when looking at the absolute number. The main roadblock is given by the large share of the population of all EA-7 countries that lives below the poverty line, which is largely the same population currently living without access to electricity. It is in this context that the most significant support not only from national governments, but also from international finance institutions needs to be channelled. Although significant efforts are already taking place, more needs to be done if the ambitious objectives are to be reached without putting a tremendous burden on government finances and thus restraining growth in other sectors. Satisfying the growth in demand of the already electrified consumers and of an emerging industrial sector seems feasible without large international support. Here, the real challenge is that of attaining a suitable investment environment to IPPs to operate in a competitive market and rapidly expand the national installed capacity, while public utilities can focus on grid infrastructure planning and expansion. Section 5.4 will discuss which policies will be needed to unlock such investment potential, both domestically and from abroad. Subsequently, Sect. 5.5 will discuss more in detail what role international public financing organisations can play in the process. “The cost of supplying a unit of energy over a system’s lifetime that incorporates the initial investment in generation, transmission and distribution infrastructure; capital costs; and operations and maintenance costs including fuel costs. Levelized costs allow us to compare different technologies on the basis of the minimum unit price a user must pay for each system to break even”. (Deichmann et al. 2011). It must be noted the cost of grid-based power generation is the cost borne by the electricity utility for power generation, not the price paid by the end-user. It does not include transmission and distribution network costs, which generally represent a larger fraction of the total cost of electricity delivered to end-consumers, or taxes and subsidies on consumption. The current average price in the region is above $0.80/l (GIZ 2017). The Gini coefficient measures the inequality among values of a frequency distribution (in this case family income), where a value of 0 expresses perfect equality and a coefficient of 1 expresses maximal inequality. Defined as “commitments to infrastructure projects in energy (electricity and natural gas: generation, transmission and distribution)”, thus excluding upstream resources production.